A note to Bill McKibben: get used to it, few care enough to pony up money for your concerns | Watts Up With That? WASHINGTON — Only one in five Americans would be willing to pay significantly more for gas or electricity, even if they were assured that it meant solving the climate change crisis, according to a HuffPost/YouGov poll conducted this week. Most Americans, according to the survey, believe that climate change is occurring and that it causes serious problems, including more frequent and severe natural disasters. But only 21 percent said they would be willing to pay 50 percent more at the pump or for electricity bills to fight it. Fifty-four percent say they would be unwilling to do so. The rest were unsure. The reluctance to pay significantly more for energy to stop climate change isn’t limited to deniers or to those who think it’s an insignificant problem. Remember these sorts of pronouncements post hurricane Katrina? Hurricanes were supposed to get bigger and more frequent, instead we’ve had an unbroken 7 years long drought for major Cat3-5 hurricanes, and Sandy wasn’t even a hurricane when it made landfall. The last Category 3 or stronger storm to make landfall was Hurricane Wilma making landfall on October 24, 2005. The more than seven years (2568 days as of today – ref here) since then is the longest such span in over a century. If you have to pay more for your energy use, you will have to work more, therefore spend more energy in the system, thus, produce more pollution and CO2. Since close to 90% of our energy, comes from fossil, spending more in on place will consume more fossil in another place. Make sense? The New Normal is that a hurricane is what I call it. A Post Tropical Storm is a hurricane if it is windy and has rainfall. Just as 65% more tornados today is true if I see on TV 65% more video of tornados than my parents saw. The New Normal is that reality is that which I experience and recall. Like Schrodinger’s Cat, a thing “is” until it is proven it “is not” by ME. (A false understanding of Schrodinger’s Cat, but a popular misconception and a useful one for many.) Today, Gore created the “cat”, i.e. CAGW while McKibben became the observer. As long as McKibben does not open the box, Gore is correct. And as long as McKibben does not internalize the definition of “hurricane”, Sandy was a hurricane. YOU call it not a hurricane, but what do you know? The box is still closed as far as he sees. Hum, I suppose this means that the average person is not as stupid or foolish as all to many pendents and advocates on any side of any question think. Just heard Bloomberg on the news criticizing the power companies for not doing enough to restore supply. Who will take the blame for inadequate protection against storm surges, which had been known for years to be a major threat to New York? If energy prices went up by 50%, no-one would ever have the resources to build the needed flood prevention systems. Let’s ask those people living on the East Coast how they like living without power, or gasoline. They’re living the carbon free lifestyle. I am sure that here in Britain a similarly large proportion of the population would be unwilling to pay more for their energy. But household energy bills are expected to rise by at least 30% over the next few years to pay for renewables. That is around US$500 extra for the average household. Now if only our feckless politicians can be restrained from doing serious economic damage with panic-stricken carbon strangulation policies, another lustrum or two of no warming will make it obvious even to them that such policies are futile and unproductive. Most Americans are wise, here in UK we have our countryside blighted by useless wind turbines that only work when the wind blows from a certain direction or a certain speed. We cannot use incandescent light bulbs because they are deemed by the EU as inefficient, instead we use “energy saving bulbs” that give a light that makes everyone look as if they are seriously ill. Some people are seriously ill because they have fallen down stairs because the things take so long to warm up! Our energy bills have rocketed because the government has decided that “green energy” needs subsidy, so the subsidies come from taxes on non-green energy. Petrol, diesel and air-fares are all taxed as are cars based on CO2/km output. The one good thing that has happened is that the majority of us British realise we are being conned and the whole nasty mess is about to unravel because most of these taxes are instigated by the EU, telling our government that the world must reduce CO2 emissions. More and more people are sick and tired of being dictated to by an organisation that is very reminiscent of 1960’s Eastern European governments. That coupled with the Euro crisis and the current mood of our government means that (in my view) we will be distancing ourselves from the EU sooner than most people think. Well done the citizens of the USA for taking a lead on this! I wonder why McKibben, President DingleBarry, and the Mayors Doomberg and Krispy Kreme are not telling the blackout victims to man-up and be thankful that they are saving the planet by going full-green? Hurricanes are becoming extinct just as the models predicted! Its worse then we thought. Our grand children will not know what a hurricane is. There is no worse sin than when a true believer in CACC refuses to make substantial changes in their own carbon emissions, or move out of flood zones, or refuse to have children, or pay much more for low carbon energy or products made with said energy. It is a blasphemy against the IPCC. The hypocrisy of the climate change horde has no equal in modern society. I’ll say it again – the only people who actually get aKICK OUT OF “climate change driven disasters” are the very ones who caterwaul about the dangers. Their gloating over the odd disaster is really sickening – where is the compassion ? Ever wonder why the people who are “willing to pay more” . . . don’t? Nothing is stopping them from writing checks. I think what they really mean is they are willing to spend more of your money. Just heard Bloomberg on the news criticizing the power companies for not doing enough to restore supply. The union linemen will take 3 times longer to restore power than other crews. Yes. I tend to argue in a simpler (IMHO) way: Renewable energy contraptions get subsidies. Therefore they lead to capital misallocation, rewarding failure, and a less efficient system results. A less efficient system uses more resources to achieve the same overall performance. Whenever you see subsidies you see inefficiency happening. I thought he argues this is the future. Now it’s the new normal? I’ve never known anyone who has ‘enjoyed’ catastrophe and human misery for political gain as much as McKibben. He is debating fossil fuels with Alex Epstein on Monday (5th Nov) at Duke University. I fear (hope) that, as Judith Curry said of Michael Mann with respect to his impending DC libel court case, “I fear the outcome will not bode well for you”. Amen to that. If Americans are so “unwilling to pay significantly more for gas or electricity,” then they need to simply reach for their wallet the very moment a big nasty Keynsian offers them jobs in the “renewable” sector. I note that the loudest screaming out of the Sandy-stricken area is from people who want energy to be available. This is a vision of the future in a climate-change-limited energy scheme for anyone who cares to notice. The big nasty Keynesian made sure half of Americans don’t pay income tax as well. That’s how they roll. Well then obviously more must be taken from the 4 against their will, right Mr. McKibben? The 1 must seize (through whatever means is necessary) the power to force the 4 to do what must be done. If it requires misuse of government resources, coercion, propaganda, deceit, collusion, intimidation, theft and fraud so be it. It must be done. No matter how much the 4 complains, objects or resists. If the public willingness shrinks to 1 in 20, the 1 must still prevail at any and all costs. The severity of the circumstance dictates only one outcome is acceptable even if means the 20 must die. Why don’t you just come clean and admit that your mission is indeed that important? Or you could just shut up and go get an honest job. You can read dozens here. Paying more may not even reduce the emissions of carbon dioxide. It would shift who can afford to burn the carbon. More power and wealth would be consumed by government frauds and wars.The climate change crisis cab be solved without any cost because it is an imaginary crisis created by propaganda. OPPENHEIMER: We need to make it more difficult for people to situate infrastructure right on the coast. Actually, we shouldn’t allow it unless it’s absolutely necessary. AMANPOUR: So ban it, bring everything in from the coast? OPPENHEIMER: Everything. It needs — and all new buildings should be in. Tell that to Al Gore, Mike. Here are some old news reports (back when few had even heard the phrase climate change) of storms battering Montecino, California where Gore bought a $9 million ocean view villa. Week’s Fourth Storm Hits Southern California Coast . California Floods Make Thousands Leave Homes . Only one in five Americans would be willing to pay significantly more for gas or electricity, even if they were assured that it meant solving the climate change crisis, according to a HuffPost/YouGov poll conducted this week. Most Americans know full well the worth of the promises of politicians, and mere assurances are worth less than that (if possible). But only 21 percent said they would be willing to pay 50 percent more at the pump or for electricity bills to fight it. Fifty-four percent say they would be unwilling to do so. The rest were unsure. The “willingness” of the citizenry is a nebulous concept, with a working definition of being willing to be forced by strength of law and arms into obedience to governmental mandates. Since this is not assured, (C)AGW-pushing activists instead push for those mandates “for the greater good”, “for their own good”. Such acceptable abuse of the language is seen in recent campaign ads, where Obama speaks of “asking the wealthy to pay a little more”. When the consequences of not acceding to such a gentle request are intrusive audits, life-wrecking investigations, government confiscation of wealth, and jail time. If I was one of the wealthy, I wouldn’t even wait for the final election results, I would have started evacuating my wealth to somewhere sane the moment I heard “asking”. What does “willingness” matter when sacrifices are demanded on the altar of “The Greater Good”? The real message of McKibben and cronies, is that it doesn’t. Plus it must be mutual sacrifice. Gore and McKibben will not surrender a single ox from their vast herds, until it is mandated the poor little guy must give up one of his two remaining chickens. And that guy must go first so G&M are assured it won’t just be they who are slightly inconvenienced. You’re getting at something there. McKibben’s 350.org is funded by the Rockefeller foundation. The new normal for me is going naked on hurricane insurance on my home in SW Florida. I’m putting two thousand dollars a year for the past 3 years where my mouth is, or rather where my wallet is. It helps for me not having a mortgage, therefor I’m not required to buy hurricane insurance mortgage companies require. 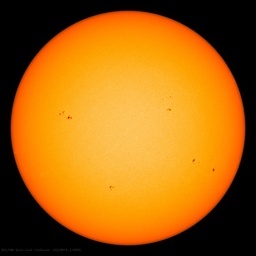 I’ve been following solar activity and science on WUWT since a few months before US House passed the 1,300+ page Cap and Trade carbon tax Bill on June 29, 2009. It was the energy tax assault on me that gave me the motivation to fight it with every fiber of my being. I was armed with solar science knowledge and after discovering the Sun was experiencing a solar minimum, I was armed with a bazooka. Every year for the past 5 years I’ve been telling family and friends with their own houses, there will be zero hurricanes in SW Florida, and that means I don’t have to put their hurricane shutters up, thanks to the extended solar minimum. I plan on milking the extended solar minimum saving me work and money for many years to come. And that from a person who rode out and lived through Hurricane Charley that hit me in my neck of the woods back in August 2004. Sure, I believe that up to 80% of the population is unwilling to pay the price of addressing AGW. We are, indeed, a nation of sheep that will listen to the most powerful forces especially when their message is so soothing (don’t worry be happy). The fossil fuel industries have such a strong death grip on our political system that very few electred officials dare to mention the words, man-caused global warming. And many on this web site attribute this statistic to the “intelligence” and “common sense” of Americans. That is, the public supposedly “knows better” than the professional climate scientists of their own country. What hope is there for such a ship of fools? It should never be said that we do not deserve what we are headed for. Another good one is that when it is finally very obvious to all that we are in too deep to get out, the likes of Anthony Watts will be blaming the scientists of the world for not issuing the warmings suffeiciently clearly. In the meantime, Anthony, congradulations!! You and you fossil fuel friends are indeed winning the most important argument human beings have ever had. I hope your grandchildred remain proud of in a couple decades. In your opinion, is global warming occurring, or not? Do you think that the storm affecting the East Coast this week is related to global warming, or not? Do you think changes in the global climate are…? If it meant we could stop climate change, would you personally be willing to pay 50 percent more on your gas and electricity bills? Notice that, despite all the palaver, hype, and hoopla, only 31.9% of respondents say Sandy is related to global warming. The real doozy of a leading question is the 3rd – Are changes in global climate related to “more frequent and severe natural disasters”? It simply assumes that natural disasters are becoming both more sever and more frequent – a complete lie. The differences in the answers between Democrat and Republican are striking. I fear you might have it wrong. We are still at a high temperature plateau and probably falling back into cooling (see Bastardi’s “TripleCrown Of Cooling”). With cooling comes a return to the higher hurricane frequency of the past. If I were in your position I’d consider getting the insurance again. Hurricane strikes were far more frequent before 1960 – when it was cooler. It’s not absolute temperature that drives them but temperature differences. Just my opinion. If given 4 more years, it will not be a poll……. Starzmom says: I note that the loudest screaming out of the Sandy-stricken area is from people who want energy to be available. I noticed the same thing. When the power is back on, this event will immediately transition to the back pages (so to speak). I’m in Michigan where a proposal to modifiy the constitution of Michigan to mandate 25% “renewable” energy to produce electricity by 2025 is on the ballot. Renewable means “wind, solar, biomass, and hydropower”. But as we in Michigan are in the process of removing dams left and right, pretty much hydropower is out. As we are in the far north and with frequent cloudy conditions, solar is pretty inefficient. I don’t believe it will pass as most people realize that this will raise electric rates substantially. I think this supports the poll that most people are not willing to pay more to save the world. It’s not just a drought of Majors making US landfall. The last ATLANTIC Cat 5 was Felix in 2007 (there were two in 2007 – Dean and Felix). Can’t find any reference of ATLANTIC storms becoming Cat 5’s after then. There have been only one PACIFIC Cat 5 since then: Celia in 2010. That is because 80% of the population is smarter than you. First off, there is ample evidence showing that fossil fuels are the primary reason for our standard of living and the reason for our increasing lifespans. You, being a hypocrite, will not give up the use of fossil fuels. You will justify it in your own mind somehow. But you will still be a hypocrite. And also: there is no empirical evidence showing that AGW exists. It’s like a guy lying in bed at night in a dark room. He is certain that a black cat is under his bed. He can almost hear it breathing. But when he turns on the light… there is no cat. And there never was. Wake me when/if you find any empirical evidence showing a direct connection between human CO2 emissions and [currently non-existent] global warming. Until then, you are no different than Chicken Little. The sky isn’t falling. You only got hit on the head with an acorn. I’d be willing to pay a carbon dioxide tax based on the global average temperature increase. But I doubt that my government is willing to refund my money when the temperature drops. The professional climate scientist knows very well that climate models do not have predictive skill. But why tell the public as long as the money flows? I find it amusing how ericgrimsrud sounds like Gary Lance after one too many drinks when he gives up suppressing his foreign accent. “You fossil fuel…” “In couple years when your grandkids…” “We see how long you keep deny when sea rise up and you strangle on kelp…” Repeat for forty sentences or 4 paragraphs, whichever comes first, and repeat the same thing for the next five comments. Hilarious. Anything wrong with laughing at that? Obviously you are a lot smarter than Anthony or the people who post here. What I don’t understand is why you waste your valuable time trolling this blog. Why don’t you use your time to build a chain of natural organic no-carbon gas stations? After that you could set up a non-fossil electric utility and put our evil coal mining funders out of business. We are waiting. Show us. The fossil fuel industries have such a strong death grip on our political system that very few electred (sic) officials dare to mention the words, man-caused global warming. Can you substantiate that please? As far as I can see, all the oil & gas industries are backing the AGW meme to the hilt. That leaves coal which is suspiciously quiet. I guess their markets are secure whatever happens. I wonder why McKibben, President DingleBarry, Mayor Doomberg and Governor Krispy Kreme are not telling the blackout victims to man-up and be thankful that they are saving the planet by going full-green? Sure, I believe that up to 80% of the population is unwilling to pay the price of addressing AGW. Why should they? Global warming is obviously not catastrophic. The 1998 mark is still not beaten on four major data sets. As well, six major data sets have 2012 in 10th place and with just a few months left, the relative ranking will not change much. Due to Sandy, apparently immediate action is to be taken. But spending billions of dollars on carbon capture to potentially reduce the global temperature by 1/1000 degree in 100 years is not the immediate action that is required. Instead, a few million dollars should be spent to make sure the backup generators in the hospitals do not fail should another “Sandy” come next year. Damn right. Money would be better spent on more efficient and resilient infrastructure. Energy is still needed, things still must be transported. If they really want to save energy then simply make the systems more efficient! Why has Mitt Romney not pointed out that the money wasted on Wind Turbines and other useless green projects should have been spent on improving flood defences for places like New York and New Orleans ? Maybe you’re right. Let that 21 percent of the people who want to pay 50 percent more at the pump do so. Give them special badges that allows them to pay that special price, while the fifty-four percent who say they would be unwilling to do so continue to pay the normal price. Then we’ll see about the remaining 25 percent who are unsure. Let’s see what side they decide to fall on then. Better yet, force all people to pay the higher price. Tell the people in Hawaii who are currently averaging $4.23 a gal that you want them to pay about $6.34 a gal because the global temperatures have risen about a degree in the past century. See if they’re intelligent enough or have the common sense to see through that argument. Good question. They can do what I do every year for Earth Day, when they ask us to turn out our lights for an hour – I tell them that after Katrina my power was off for a month. By that account, I’ve made up for the next 720 “earth days”. As with countless similar polls, the questions are skewed in favor of CAGW, which means that had they been honest questions, the results would have been even more dire for the poor erics of this world. Imagine what a terrible burden they must bear, when, even in a CAGW-inspired poll, only slightly more than 1/3 of his Democrat buddies would be willing to pay 50% more for energy if it meant “stopping climate change”. Such hypocrisy can’t be good for the psyche. Poor Ericgrimsrud! He drank the koolaid and is, unquestioningly,, repeating the meme he was taught. There is no “death grip” on the political system by the fossil fuel industry. They go with the flow, as it were. Give us some facts, Mr Eric. And the evil Koch brothers. You forgot to mention them. Another paper tiger for you to demonize and destroy. Mr Eric, this is about science and facts. That is all, beginning and end. If you paid more attention to reality, which the facts tell us — beyond the deliberate scare, which is designed to frighten us into unthinking compliance — you might learn something. Drop the rhetoric. Just the facts, sir. Even though that is a position I’m sure he would agree with, he’s politically savvy enough to know that that would not be a good thing to point out now. Plus, capitalizing on people’s misery is something Democrats are more apt to do. Just heard Bloomberg on the news criticizing the power companies for not doing enough to restore supply….. So why isn’t Bloomberg criticizing the unions for refusing to allow the repair crews from Georgia and other states to help just because they are none union workers??? After the story hit the media it was of course spun. ….A Jersey Central Power & Light spokesman said crews from throughout the nation were now working in JCP&L’s service area, including from California, Idaho, Kentucky, Florida, Michigan and North Carolina. He did suggest that municipal companies might have issues working side-by-side with non-unionized contractors. A 6-man crew dispatched from a municipal utility in Decatur, Ala., to help restore power in Seaside Heights returned home after the company was sent paperwork implying that the crew needed union affiliation before going to work in the Ocean County town, the utility’s general manager, Ray Hardin, said this morning. The crew, which was at a staging area in Virginia as the company awaited “clarification,” eventually returned to Alabama on Thursday after getting word that Seaside Heights had received the help it sought, Hardin said in a statement…. Lots of cover-up and plausible deniability with a very prominent withdrawal of the story in the news yet skeptics don’t even get a one liner hidden in the personals when we uncover bloopers like 97% of climate scientists agree with CAGW. What all of these “markets” have in common is that they all reverted to their long run means. In the case of the market for hysterias humans are fascinated by tragedy and forecasts of future doom so this market regularly goes through its peaks and troughs according to the disaster de jour. We are currently seeing the climate change hysteria market’s prices fall as measured by polls but they’ve been falling steadily since 1999 with minor spikes around well covered weather disasters. Rockefeller Family Foundation >> Sustainable Markets Foundation >> 350.org…. I suggest Eric do a little fact checking into what Rockefeller (Standard oil) supports before uttering that whopper again! In 1975 British writer Anthony Sampson penned The Seven Sisters, bestowing a collective name on a shadowy oil cartel, which throughout its history has sought to eliminate competitors and control the world’s oil resource…. …By 1920 Exxon, BP and Royal Dutch/Shell dominated the world’s booming oil business, with the Rockefeller, Rothschild, Samuel, Nobel and Oppenheimer families, along with British and Dutch royals owning the brunt of their stock. Two other Rockefeller babies, Mobil and Chevron, weren’t far behind the Big Three. The Texas Murchison family – themselves patronized by the Rockefellers – controlled Texaco, while the Mellon family – with its own ties to the Rockefeller fortune – controlled Seventh Sister Gulf Oil…. Sure. Perpetual motion machines don’t work. A re-elected President Obama will institute a “carbon tax” within the first months of his second term….he’ll want the cash to pay for Obama-care, and he also wants to leave a climate control legacy. You heard it from me first. Cheers, Charles the DrPH p.s. I still miss REP! P.S. – It’s a very common error. I hear it regularly on the radio. Want to bring manufacturing jobs back to home turf? Stop all subsidies for solar and wind generation and let them compete in the private world of capitalism, turn on all turbines and dust off nuclear plants, freeze minimum wage for 5 years, provide college style manufacturing skill-directed pell grants to middle aged displaced workers, and break open private investment in start up domestic oil and gas refineries, increased production of current facilities, and exploration for the next 15 years by rolling back governmental interference and unreasonable law suits that hinder such activities. And for heaven’s sake, start cutting some trees! The price of imported oil will drop like a stone due to competition fears. Then of course there is a difference between what the 21 percent say on a poll and what they will do in reality. Pamela, using trees for energy has problems, not least of which is that you pretty much need to clear-cut to make it economically feasible, and the further away your source is, the less feasible it becomes due to the trucking costs. Sensible forestry practices are one thing. Trees for biofuels are not a good use. PS I also still miss REP and still pray for his family when they come to mind. Bruce, my somewhat off topic issue of trees had to do with logging for lumber as well as opening up federal forests to folks who gather wood for fuel. I was not thinking at all about biofuel from forest products. Bill McKibben is debating Alex Epstein, an advocate of fossil fuels, at Duke University on November 5. It would be nice to see McKibben answered effectively, and that may very well happen. Regarding the debate; What side was Epstein on again? The question wasn’t asked, “Do you believe that globbal warming is caused by anthropogenic CO2.” So the response indicates that they disbelieve, or are dubious, that paying more at the gas pump will alleviate global warming. The last question was “even” if you believed, in order to capture all those who don’t believe. So no hypocrisy, no disconnect.